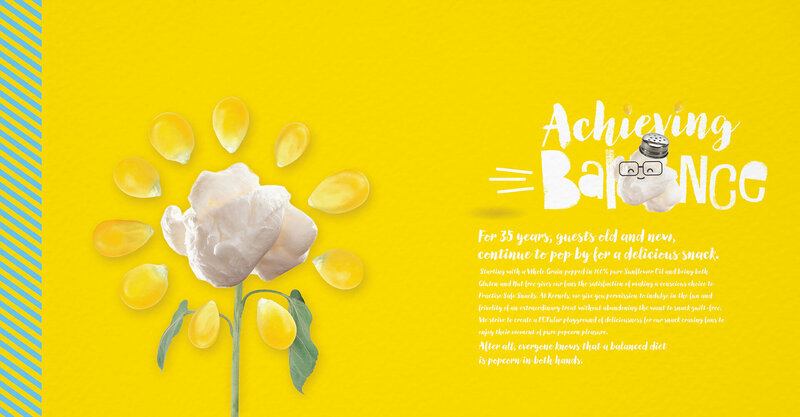 Since 1983 Kernels has been producing Extraordinary Popcorn, with more than 80 stores across Canada.Starting with a Whole Grain popped in 100% pure Sunflower Oil and being both Gluten and Nut free gives fans the satisfaction of making a conscious choice to Practise Safe Snacks. Particular people with a profound passion for perfectly popped popcorn (Say that with a mouthful of Creamy Caramel!) should get set for a moment of pure popcorn pleasure. Kernels is a known brand in the Canadian retail environment, and has outlasted numerous challenges to its retail popcorn supremacy. 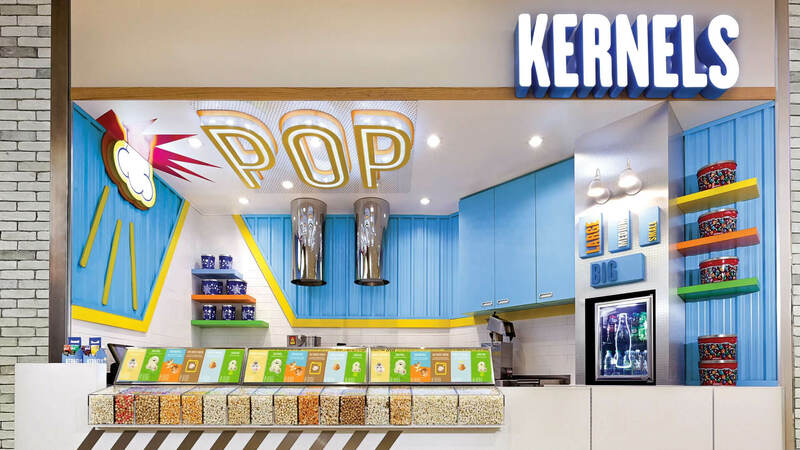 In an increasingly crowded marketplace and retail sector under fire, it was increasingly important for Kernels to become a more relevant and meaningful contributor to the retail shopping experience. Sadly, the existing design had become dark and moody, with a stylized graphic of a sunflower that paid homage to the oil that the kernels pop in. But the oil is not the hero; showcasing the fun and permission to snack is what the brand is all about. In order for Kernels to be great, we needed to focus on the Extraordinary POPabilities that are inherent in the brand offering. For any brand, it is imperative that things stay fresh and relevant to the changing tides of consumer opinion and retail appeal. When considering the various touch points for the brand, it became obvious that it was time for change. 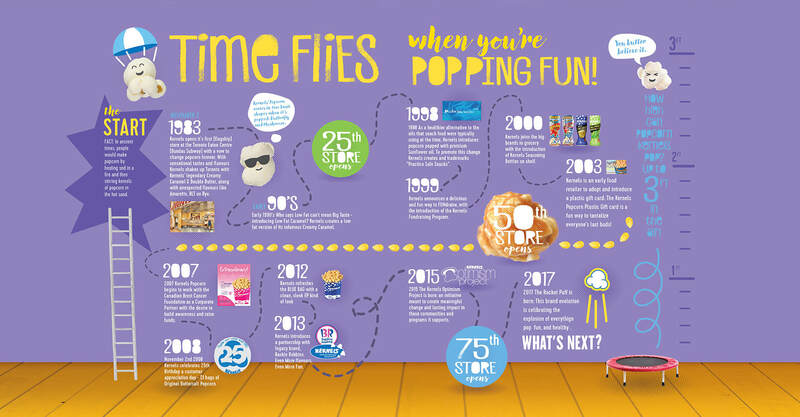 With a goal to push the quick service retailer envelope, it was important that the rebrand wasn’t limited to just one aspect of customer interaction – we left no kernel un-popped. We overhauled the logo, icon, typeface, colour palette, in-store environment, packaging, menu display and also the online presence and website. We set about on our objective: finding the kernel. 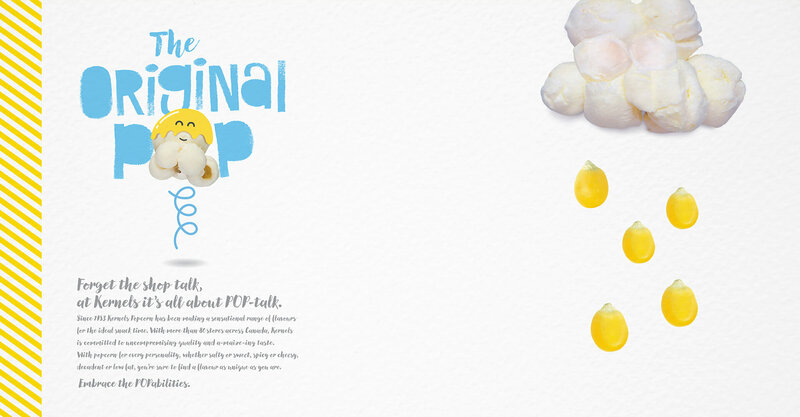 In our brand exploration, we allowed each new idea to POP, and in doing so, the individuality of each kernel came forward. With an objective to be bright, abstract, expressive and dynamic, we strove to evoke an emotional response from fans of all ages, from kids to adults. 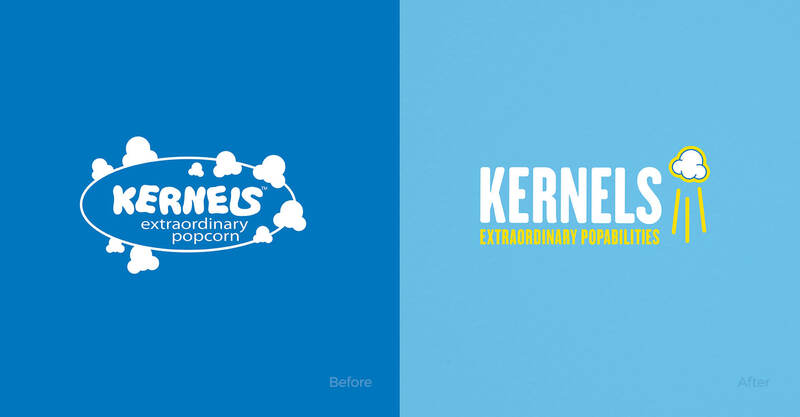 The “Rocket POP” icon put motion to Kernels in our brand rethink. With new energy came the opportunity to freshen the image and bring a smile to the consumer. Popcorn is fun (we dare you to try eating a bag without smiling once; it can’t be done). We modernized the typeface, freshened the brand color pallette, characterized the flavors, and created sociable & instagrammable moments in the architecture with signature brand moments. Because the experience can’t stop at the point of purchase, we created packaging to act as an ambassador of the brand, establishing a strong recognizeable for take-away. 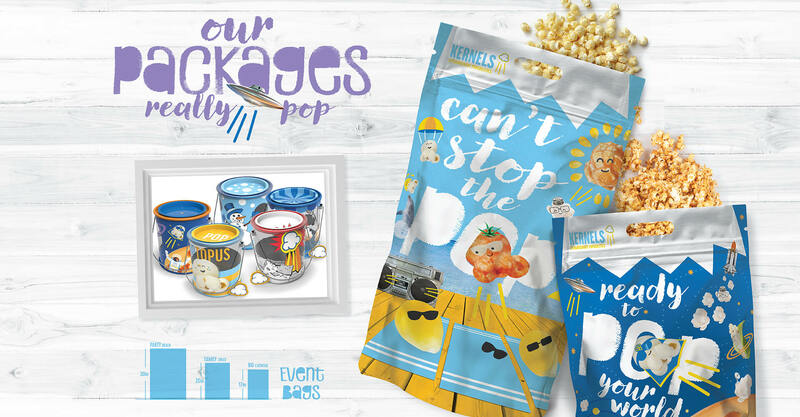 Party packaging was another opportunity to excite and play up the fun, while integrating digital media directly at the point of purchase was a must. All other brand touchpoints carry the same voice and vibe, for a fully immersive consumer experience. 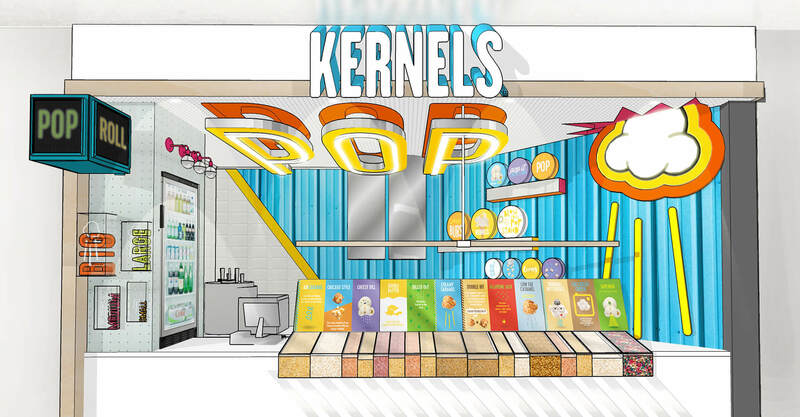 The new Kernels store brings big flavor with a bold and bright design. The digital menuboards reflect the personality of the flavors in a big way and is fun for fans of every age. Excitement is created from a distance with full screen take-overs and character animation. The juxtaposition of textures and materials creates interest throughout the whole store. 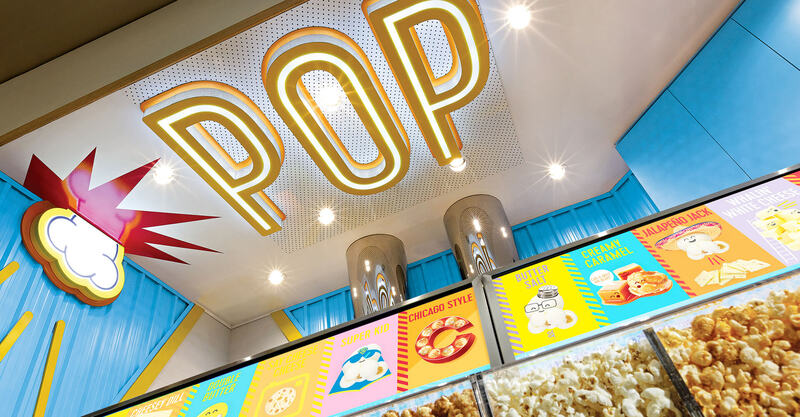 Illuminated visual strike zones like the ‘POP’ ceiling sign and the ‘Rocket POP’ create a pop-art (pun intended) moment. Thinking about popcorn past, vertical lines pay homage to the nostalgia of vintage popcorn bags. Bringing delight to the retail experience aligns perfectly with the expectation of consuming the Kernels product. A fresh face to match the fresh flavor was taken to heart, with a character executed for each new flavor created. 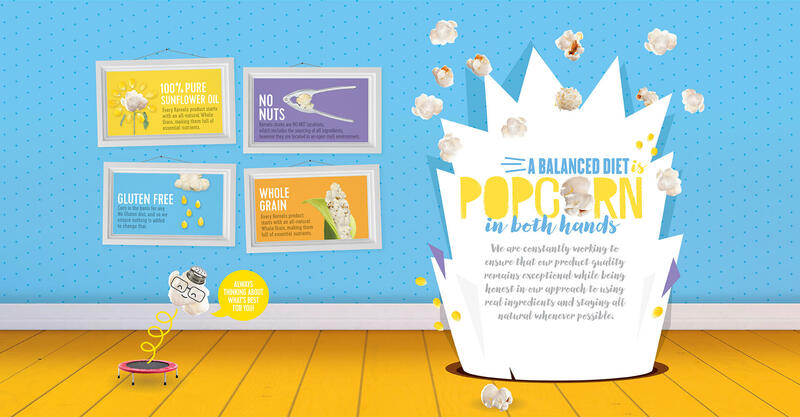 The contrast created by blending graphics with photography emphasizes the real and natural characteristics of the product, while the utilization of single popcorn characters is a playful way to showcase the individuality of every kernel and flavor. 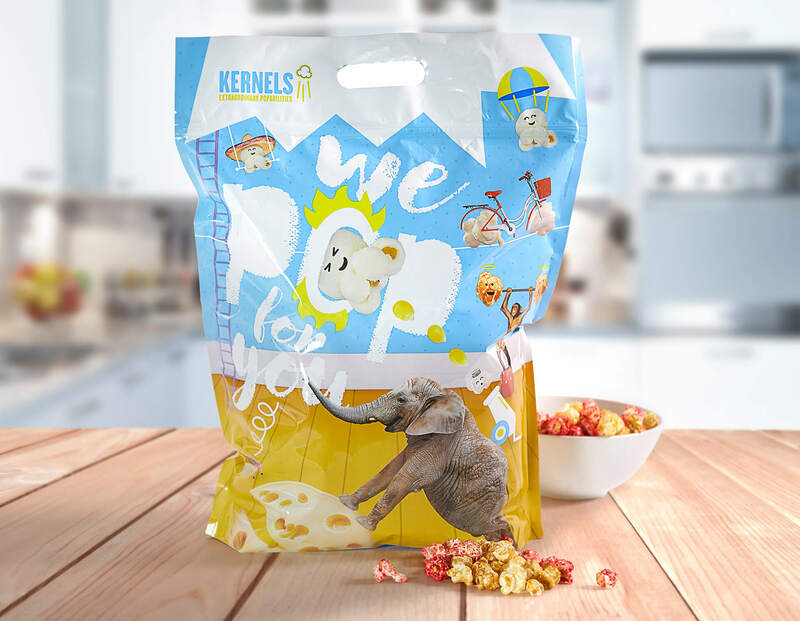 With so much attention paid to social channels and a brands’ online presence, it was important that we captured the excitement behind Kernels while making it part of an everyday lifestyle. 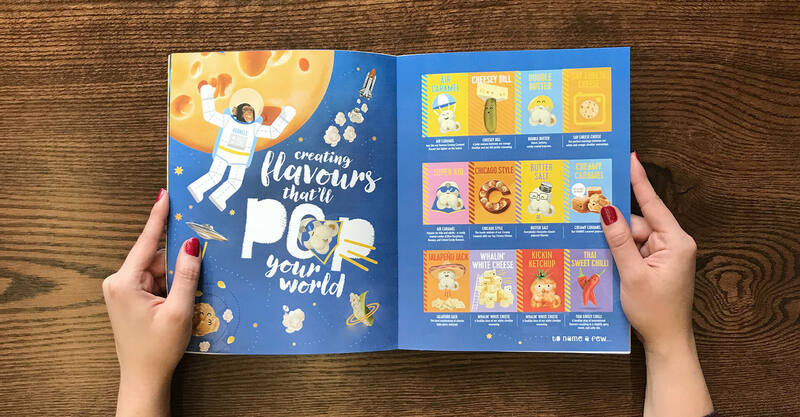 Focused on quality of the ingredients and the personality of the wide variety and quality of the flavors meant building POP-characters that highlight featured brand moments. 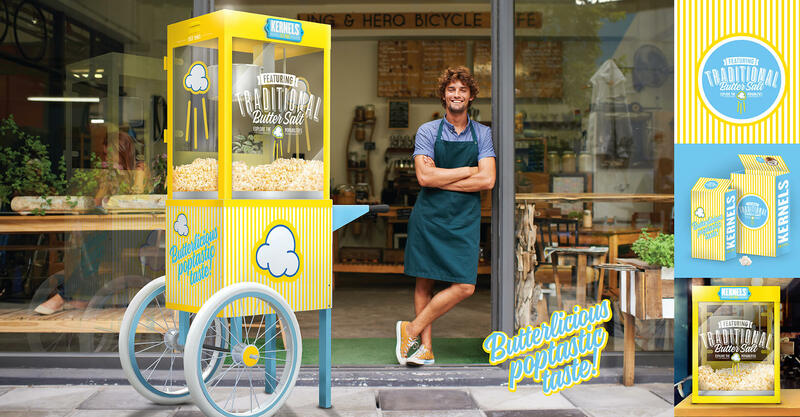 With popcorn for every personality – salty or sweet, spicy or cheesy, simple or decadent – there is a flavor as individual as each customer is. 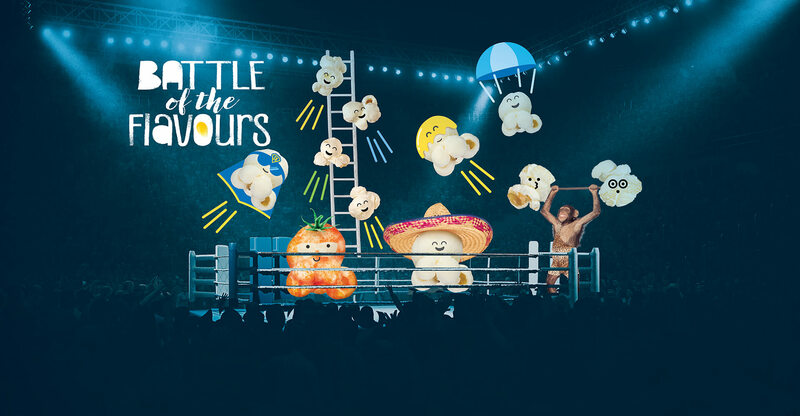 With every kernel popped with care and flavors that define the expectation, we blended illustration, graphics, photography and the use of animation to provide real-life charisma and a visceral connection to the brand experience. With an objective to be bright, abstract, expressive and dynamic, we strove to evoke an emotional response from fans of all ages, from kids to adults. With a legacy brand it was critical to remain immediately familiar to those that have celebrated us for decades, while capturing the hearts and hands of a growing cohort of new shoppers. Year over year, Kernels has endeavored to create new and exciting flavors that recognize trends and are up to their extraordinary standards. All the while, Kernels has remained mindful to use real ingredients and stay all natural where possible. Despite this, the brand was missing a narrative and story that fans could latch onto and make their own. Brand personalization is important to next generation shoppers, and with the mission of making everyone, everywhere, think of Kernels when they want a snack (not just popcorn), we had to rethink what it meant to be a popcorn crusader, and redefine the Kernels brand perception for fans new and old. With a legacy brand it was critical to remain immediately familiar to those that have celebrated us for decades, while capturing the hearts and hands of a growing cohort of new shoppers. 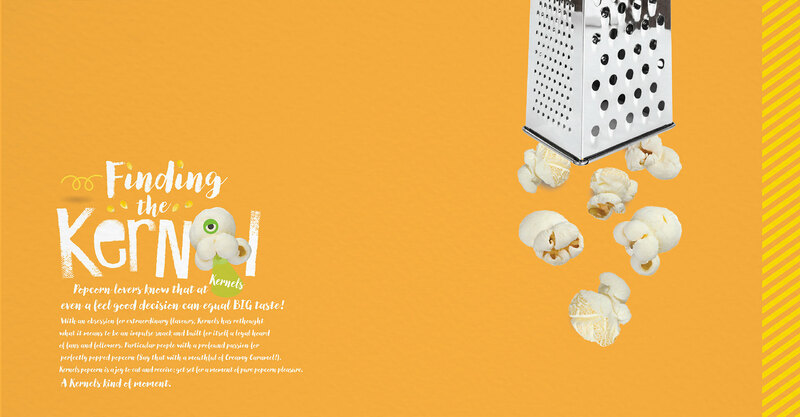 Kernels required a fresh face to match the fresh flavor. Softening the blue was critical in setting the happier tone and vibe of the brand. A percentage of the original dark blue was maintained in the design for legacy and equity, although we reduced its use to signature moments. With a bold use of color and pattern the brand stands out at a distance, but as the customer draws closer, the fun and levity of the brand becomes apparent. 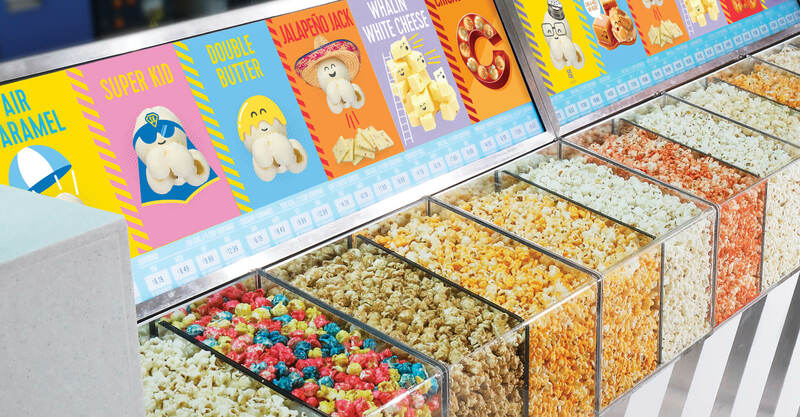 Digital media and motion graphics in the consumer-level menuboard integrates with the popcorn display. The animations give the flavor characters life and personality, often bringing a smile and an emotional attachment to a guest. Full screen take-overs continue to provide strong brand moments and an opportunity for enriched brand messaging. The rebrand has been well-received, with positive reactions of excitement and approval from the retail and social community and fans alike. People are talking. The brand achieved over 25,000 fans on Instagram. Stores that have been converted to the new concept are seeing a resurgence in performance and the strategy of building characters and personality into the flavours and packaging has driven check values up with a renewed interest in the brand and excitement about the product. 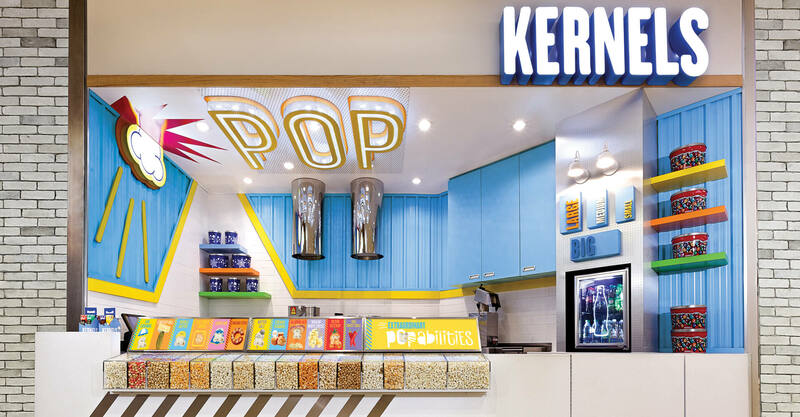 Ultimately, Kernels continues to be a unique and successful concept in the retail industry with an intent focus on ensuring customers, old and new, continue to POP by for a delicious snack.